Bees on the hunt for nectar, helping me fulfil this weeks photo challenge. Sandra at https://daffodilwild.wordpress.com is one of the hosts for this meme.There will be lots of people out on the hunt. 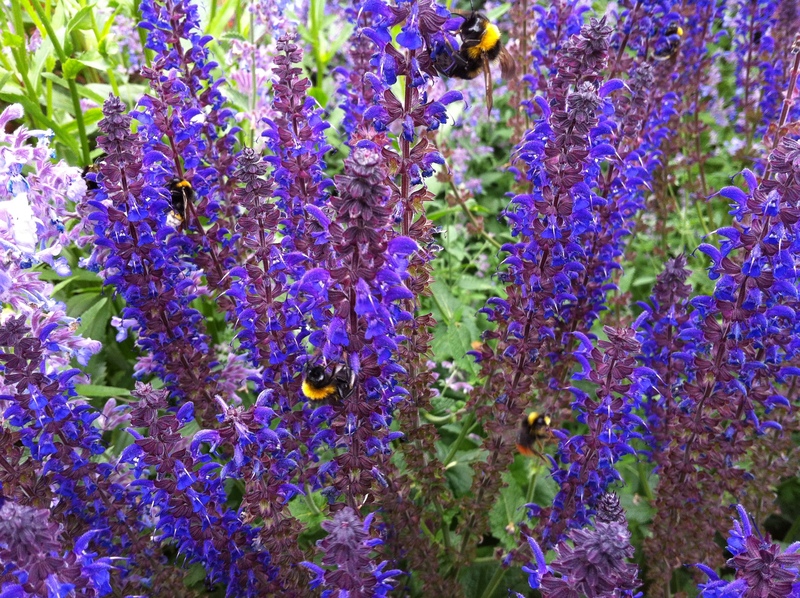 I should not mind a bit of that sunshine, right now, or those bees or those blue salvia nemorosa. No point hunting, we will have to wait until about May. Is it me or is Monday here again quicker than expected? After all the pinching last week I felt I should do the decent thing and snip a few precious flowers from my new planting. All of the flowers have been transported from my old garden in the form of cuttings or pots and planted into raised beds that were already in situ. The area is South facing and is very sheltered thanks to the buildings that surround it. Consequently it means i have an ideal spot for my sun loving plants and collection of succulents. 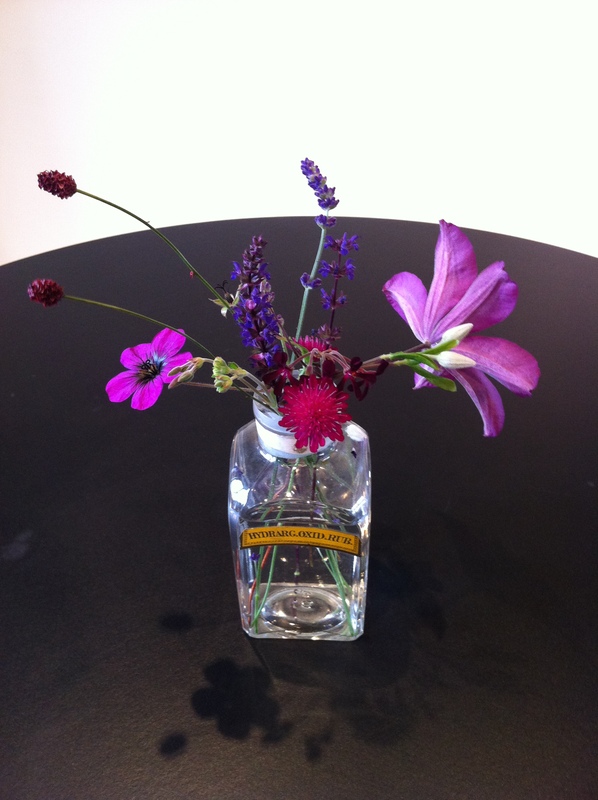 The planting includes lavander, Lavandula angustifolia ‘Hidcote’ and Salvia nemorosa for a litle on- contact scent. Sanguisorba officinalis ‘Red Thunder’ for its dark bobbles and Geranium ‘Ann Folkard’ for its long lasting flowering period, its rather scrambling habit and its slightly lime toned leaves. Pelargonium sidoides for its blue grey foliage and its velvet looking flowers and last but by no means least Knautia macedonia for its perfect pin cushions of claret. Then there is the whopping great purple flower. That is a Clematis that has been allowed to remain as its colour sits well amongst the bruised tones. Not sure which one it is. It has lovely seed heads after flowering so it gets my vote. And that is it for today. My vase was kindly provided by my sister as she knows I have a liking for pretty medicine bottles. Sat on the kitchen table, I am liking the way the overhead light has cast a shdow of the blooms. So that is it, my vase for this Monday. 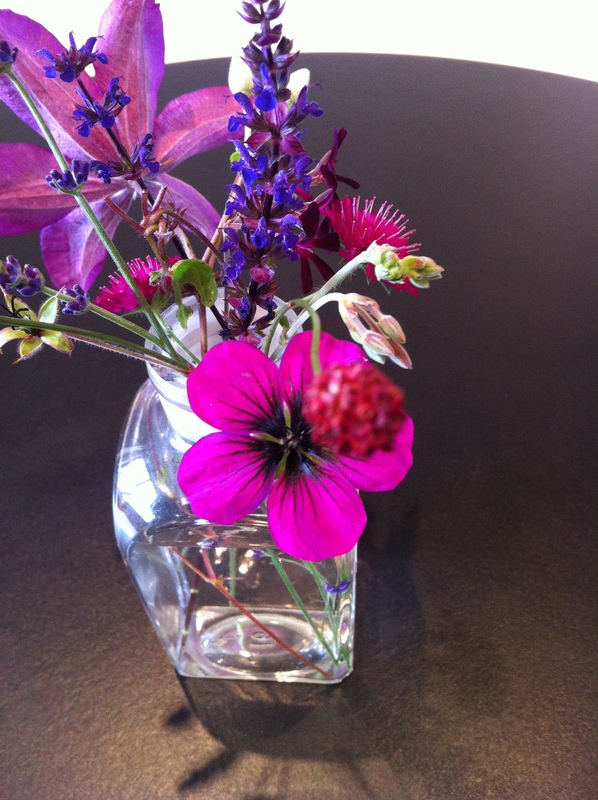 To see what Cathy and other bloggers have put in their vases, take a look at http://ramblinginthegarden.wordpress.com/in-a-vase-on-monday/2014/09/22/jumping-the-gun. Over the last couple of weeks, I have been on the look out for local honey, to give to two hay-fever sufferers in my house. My daughter has had acute symptoms and several people have suggested a spoonful of local honey may help. I tried the local health food shop and the Farm shop without success. Eventually I found some at the Farmers Market which came from Ashridge. It is clear talking to people who have bee hives, that things are tough for them there bees. So today I was delighted to watch numerous bees hard at work. The plant is Salvia nemorosa or Balkan clary. It is a small growing bushy type of salvia with aromatic leaves and deep blue flowers. Grown at The House for its colour, it needs a sunny position on free draining thin soil, so thrives here on its chalky soil. Anyway they just look delightful and I thought you might like to see them too. I would be interested to hear if any of you have had success with the spoon of honey treatment.